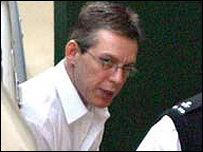 Jeremy Bamber, who was convicted of murdering five members of his family 20 years ago, has begun a new attempt to prove his innocence. Bamber claims previously unseen photos of his dead sister will clear him. Bamber, 44, has always denied shooting dead his adoptive parents, his sister and her twin six-year-old sons in Tolleshunt D'Arcy, Essex, in 1985. He hopes to secure a third appeal against his convictions. Two previous appeals in 1997 and 2002 failed. Lawyers claim the photographs prove he was in police custody when Sheila Caffell - nicknamed Bambi - was killed. Detectives initially suspected that Ms Caffell, who had failed to take her schizophrenia medication, had murdered her parents, Neville and June and her sons, Nicholas and Daniel, before turning the gun on herself. Bamber, who stood to inherit almost £500,000 from his parents' estate, was convicted of the five murders in 1986. Legal adviser Giovanni di Stefano has written to the Criminal Cases Review Commission with details of the new evidence and now hopes a further appeal date will be set. He claims pictures of Ms Caffell taken at around 0900 BST on the day the bodies were found show her covered in fresh blood, suggesting she could only have died a maximum of two hours earlier. Bamber was taken into custody by officers at 0300 BST that morning after calling police to tell him about a dispute at the family home.